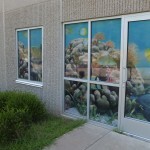 For window, wall and interior applications, the most innovative digital media solutions are found at Ultraflex Systems. UltraVision Window Perf 60/40 UV is a perforated window material with a 40% open area that offers two-way viewing perfect for store windows, vehicle windows and other window applications. Available in 39 inch and 54 inch wide rolls, this perforated window material is a white gloss calendared graphic film with a black back and features a non-adhesive front side that can be printed with solvent printing equipment. Signetics magnetic receptive media can be used in countless applications such as wall graphics, menu boards, retail POP, directories, interior decorations and more. Signetics Select has a smooth backside that eliminates print scratching when the magnetic receptive media is stacked or rolled. Compatible with solvent, eco-solvent and UV equipment, this product is perfect for high-traffic applications and is available in four sizes. One of the many reasons Ultraflex Systems is a leader in the industry, both nationally and throughout the world, is the product and application support that we make available to digital media users. Members of our team are subject matter experts, and our experienced and knowledgeable resellers are always on hand to answer questions on our quality media. Literature resources such as FR Certificates, Technical Data Sheets, Welding Specifications and more are available on all Ultraflex Systems products. Additionally, we offer a free sample program, which allows you to try a magnetic receptive sheet sample, perforated window material or other Ultraflex Systems product on your equipment. Contact us today for more information or to request a free sample.